The KD-II paintball marker is a refinement of its predecessor Kaos-D, bringing the mechanical markers to a new milestone, once again. With the already reliable Stacked tube lowback(STBB) platform and utilizing the revamped Zero-D low-pressure system, KD-II is now even more air efficient with an operating pressure of 225psi and higher consistency in every shots. The tool-less ZeRO-D system is now directly threaded onto the body for easier maintenance and reliability.KD-II featured with an improved trigger giving user a lighter and softer trigger pulls ever on a mechanical marker, now beware of the addiction rate of fire from a mechanical semi-auto marker.The KD-II also comes with a clamping feedneck to lock any loaders tight in place, a refined 2-piece 14 inch barrel (.689 bore) for greater accuracy, and the air-flow friendly angled regulator collar. The five combination of dust & polised colors offered are: Emerald, Aurora, Titanium, Blue King, and Ninja. 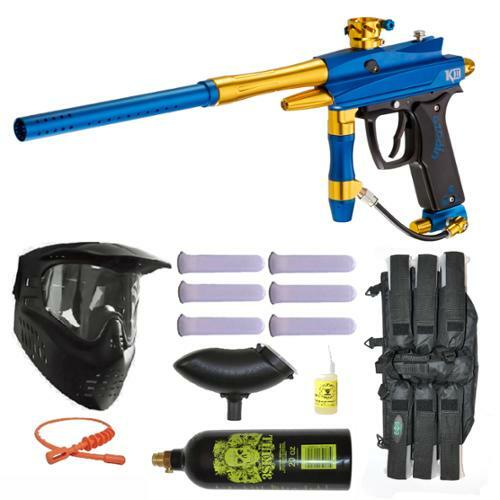 State and local law applies Some paintball and airgun orders will be cancelled. mechanical marker, now beware of the addiction rate of fire from a mechanical semi-auto marker.The KD-II also comes with a clamping feedneck to lock any loaders tight in place, a refined 2-piece 14?? barrel (.689 bore) for greater accuracy, and the air-flow friendly angled regulator collar. The five combination of dust & polised colors offered are: Emerald, Aurora, Titanium, Blue King, and Ninja.